do I have to remove engine from frame or drop it a bit to get acces to pump? Or can shaft be just pulled out and both seals changed? Frame covers two bolts of the case. Looking at that parts diagram you won't be pulling out the pin without removing the side case as the drive inside has a pin that goes through the shaft by the looks of it. 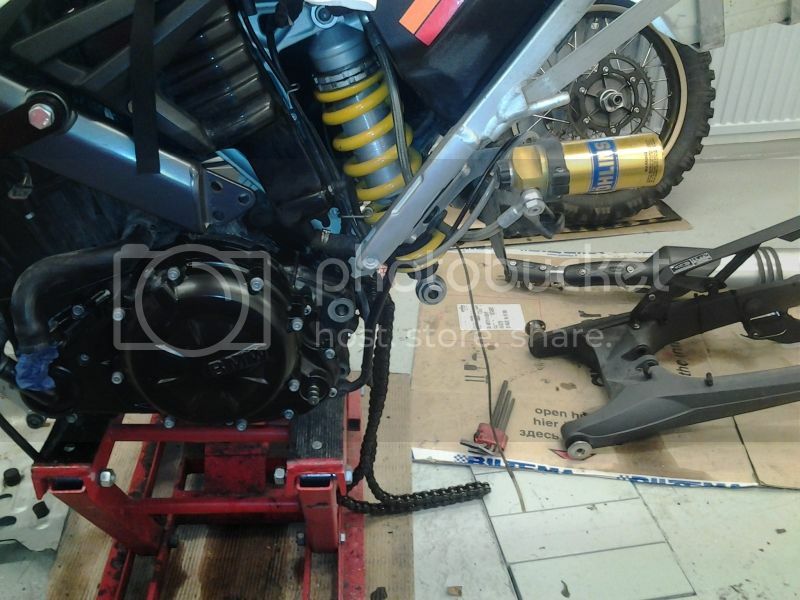 And to get there you need to remove exhaust, swing arm, right side frame cast part, side stand..
Rear frame need also to get "loosen". See the grooves on old shaft. Used for 4 years and 27tkm. Here its getting back together. Rekluse needs some spares tough. I only washed and lubed them, felt OK so far. looks like a lot of work . how many hours did that take ? is it possible to leave the exhaust header on ? Excuse me, for bringing up this old thread....but my bike is now lying on its side with only frame section waiting to be removed. For next time, I'm hoping to make this ordeal an easier one. Does the frame section need to be removed only for the purpose of accesing ONE remaining bolt on the left engine cover? Antti, how are you supporting the bike on it's engine? What about the oil pipe and other vulnerable areas?? Bliss probably have done the job but Yes, frame section needs to remove only for that one bolt.. I think i had bike on the stand, maybe i used some wood pices between but it went just OK.
Also used double lipped SKF seals. rocky burns, do I understand correctly, you can remove the propeller (impeller) from the outside and slide the seals off with the shaft in place? How did you grab the inner seal? If you say it's possible, this is really good advice! I'll start taking a pair of seals for longish trips as this seems like a decent roadside repair method! Its a roll pin that goes through the impeller and is tapped out quite easily, then drill a small hole in the seal and insert a self tapping screw, the seals are only soft and will pull out with a small pry bar. I think I`ve read at HUBB that someone rode thousand of kms while it dripped few dropps during the day. Only cheked coolant level every now and then and serviced the pump on better time. Easy job but frame contruction on XC makes it a lot worse.